Description: Smith & Wesson M&P22 Compact .22 Long Rifle 3.56 Inch Threaded Barrel 3/8x24, Adjustable Sights, Black Hard Coat Anodize Finish,10 Round magazine, Single action (internal hammer). White dot front sight. White 2-dot rear sight is screw adjustable for windage and elevation. Polymer grip. Carbon steel barrel. Aluminum alloy slide. Polymer frame. 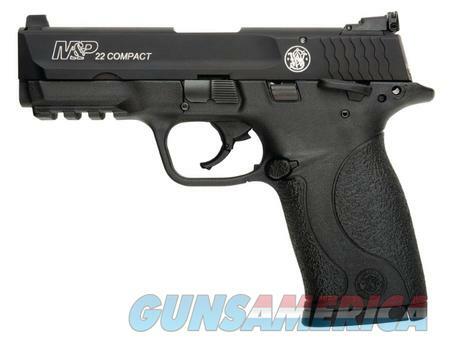 Reduced scale version of the full-size M&P pistol. Ambidextrous manual safety. Reversible magazine release. Picatinny style accessory rail. Magazine safety - will not fire without magazine inserted. Internal lock. Captured recoil guide rod and spring for easier assembly/disassembly. Made in USA.